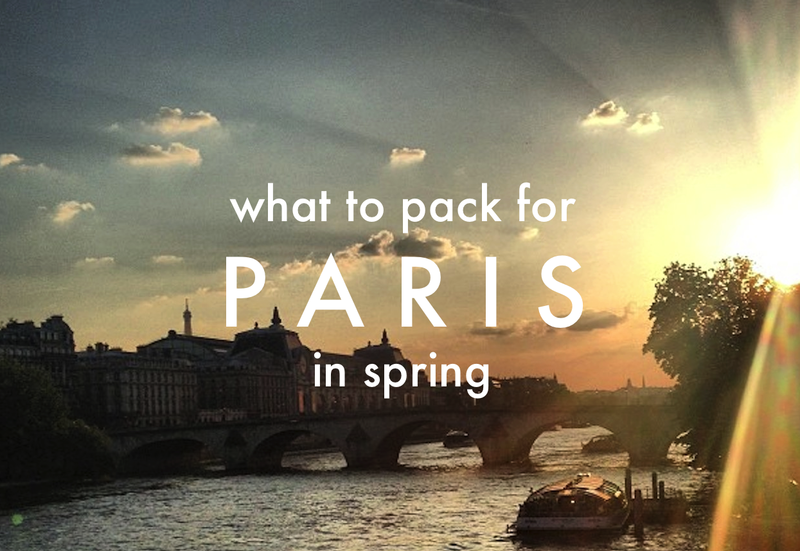 I never thought to make a Paris spring packing list because there are a lot of them. However, a quick search on Google turns up glaring inaccuracies. To tackle a few, nobody wears skater skirts, sundresses are typically worn ironically, and only tourists wear hats other than beanies. Maybe things were different a few years ago. Today, for an idea of what French girls are wearing any given season, look at Saint Laurent, which somehow trickles down to every age and economic bracket. If you are a guy, just dress like Aziz Ansari. Umbrella- crooked handles are best, so your hands are free to Snapchat. I like Pelcor's renewable cork umbrella. If you bring a dress, something 90s, like Reformation's Dime, Penny, or Hackman, would fit right in, under a jacket with tights and a scarf. Bomber jacket / denim jacket / colored biker jacket / duster / hip-length, collarless light wool jacket, especially in tweedy grey or navy. Weirdly, my waxed cotton full-length raincoat is on trend now- thanks, Monica Rose. One solid t-shirt, unisex fit (like a Jungmaven shirt). It can have minimal writing on the front. Also pack a striped t-shirt, same fit. For night, an influx of stylish Russians upped the glam factor at places like l'Arc and Maria Magdalena, so you can wear the aforementioned 90s dress with ankle boots, or skinny jeans and an embellished jacket with a silk camisole, or an Anthony Vaccarello / House of CB / Self Portrait / Valeria style outfit, bodysuit with mom jeans, etc. Finally, athleisure is just as popular in Paris, for all ages, as elsewhere. The sample wardrobe pictured above should fit easily in a carry-on, yielding 30 outfits in 15 pieces, not counting the umbrella. For an around the world carry on wardrobe, click here. It really hurts me to hear that the Saint Laurent style is the norm... :/ but I read somewhere that Hedi is on his way out. I don't know what Jennifer Lawrence style is/means, but the phrase cracks me up for some reason. Anthony Vaccarello will have the same effect I think, but at least his clothes are not SO normal that the price becomes a slap in the face. The Hedi Slimane stuff, am I wrong or could anyone just buy the same things at a thrift store?! Even those plain leather boots! yes!!! I saw the Saint Laurent store in Dubai i was so disgusted by what was hanging in there that I couldnt get closer than 8 ft from the store. Like WTGoodwill is this???!! Nothing wrong with Goodwill, but when it's sold at whatever the heck they charge. You mentioned a tunic in a flowy material, but not viscose, which I completely get. Have you much experience with clothing made from modal or a modal blend? Hi Nicole, thank you! I had one modal dress but I noticed it picked up lint and cat fur really easily. It had a nice sheen and softness, and didn't wrinkle or fade, but it was very heavy. That's my main experience though. The only thing I've heard to be careful about though is that European modal is environmentally friendly, but Chinese or Indonesian modal can be derived from clearcut rainforest wood. Thanks for your quick response, Ariana! That's really helpful. I was considering purchasing an All Saints t-shirt from Depop that was 85% modal and 15% silk but wasn't sure of the longevity. It's made in Portugal so it may be ok environmentally speaking.